Timeline for Ellen Nora Payne (nee Field), 1933 to present • Who was Nellie Payne? 11th November Nellie attends Melbourne War Memorial dedication ceremony wearing a medal, DB157. Rectors stall – Holy Trinity church, North Hobart, Tasmania, DB17. Queen Mary club members book, DB71. Hutchins school G.C.Nichols fireplace, DB166. Nellie travels with Madge to Asia (on Taiping). 17th September Nellie judges at the Tasmanian Arts and Crafts Society Hobart Annual Exhibition (Mrs Agnew fellow judge and Phyllis Payne – granddaughter wins ‘wool wallet’ section). 30th November Nellie attends ‘Welcome Home’ bridge party for Lady Clark (Governor’s wife) at Mrs J G Mitchell’s home ‘Eltham’ Sandy Bay, Hobart. 31st November Nellie attends Queen Mary Club bridge party. Nellie carves Honour Roll for Christ Church Longford TAS for Mother’s Union of Longford, DB39. December Nellie and Madge attend Mrs W B Cropsting Garden Party. 21st June Nellie’s font cover for St Andrew’s Church Centenary celebrations is dedicated. The cover is placed on top of “Belstead” font, DB4. 22nd September Nellie judges at the Tasmanian Arts and Crafts Society Hobart Annual Exhibition (Mrs J Agnew fellow judge). Memorial organ screen – Holy Trinity Church, North Hobart, DB177. 14th September Nellie judges at the Tasmanian Arts and Crafts Society Hobart Annual Exhibition. Nellie completes the Honour roll for Christ Church, Longford, Tasmania. Presented by the Mothers Union on the occasion of the Diamond Jubilee. Dedicated March 7th 1937 by the Rev T.J. Gibson. The words in the centre were thought of by Phyllis Payne (Nellie’s grand-daughter) – at the age of twelve, “The Mothers gave their sons. Their sons gave their lives”, DB39. Viti Allardyce Dower chest, DB99. 9th January Nellie’s ‘Seven sisters screen’ (chancel or rood screen) daughters of Thomas and Elizabeth Field of “Westfield” Westbury, is unveiled and dedicated in St Andrews Church Westbury by Rev G W Bethune, DB2. 19th October Nellie judges ‘Art Work’ section of the Arts and Crafts Society Competition. Nellie carves a memorial plaque for Elsie Anderson, DB8. Nellie commissioned by Tasmanian Public Works Department to carve ‘Coat of Arms’ for Parliament House, Hobart, Tasmania, DB68. Nellie presents Collegiate School Hobart TAS with Headmistress’s Ceremonial Chair from the Prefects of 1939, of which her granddaughter Phyllis was one, DB58. Nellie carves Endowment Roll for Home of Mercy, Sandy Bay, Tasmania, DB138. 11th October Nellie awarded 2nd prize for ‘large Hand-made floor rug made with ‘jewel’ needle on hessian’ on Women’s Industries Competition Hobart. 29th May Nellie opens St Andrews Church Fete held in parish hall – is given flower bouquet and cake. 16th November Nellie and Madge hold party at home for Geoffrey’s 19th wedding anniversary. 18th December Nellie holds woodcarving exhibition at home at 26 Antill Street Hobart to aid war effort for the Red Cross, DB125. 2nd March Nellie dedicated Endowment Roll for St Andrew.s Church, Westbury. Tasmania, DB7. Nellie presents Collegiate School with a carved platform desk and stool, a piano stool, a hymn board and ornate font cover, DB55, 56. Nellie writes ‘Short History of St Andrews Church’ Westbury, Tasmania. For the duration of the Second World War, Nellie conducts, in conjunction with the Red Cross, craft workshops for returned injured soldiers. Kneeler – St Michael’s Collegiate, DB167. 6th March Elizabeth Payne (Davson) Dower chest, DB87. John Soundy table – Friends’ School, Hobart, Tasmania, DB60. 11th October Nellie wins ‘hand-made floor rug made with jewel needle or rug canvas’ section of Women’s Industries Competition Hobart. Tulloch Field Dower chest, DB107. Dawson memorial plaque in St Andrews Church, Westbury, Tasmania, DB11. Font cover as gift from prefects of 1944 at St Michaels Collegiate, DB57. Granddaughter Phyllis Payne Dower chest, DB88. Alms box – Launceston Church Grammar School, Launceston, Tasmania, DB136. Side chairs X 2, St Michaels Collegiate, Hobart, DB58b. Hutchins School, Hobart, Tasmania, Headmasters board, DB51. Altar, Reredos, Hymn Board, St Mary’s Church, Gretna, Tasmania, DB23,24,25. 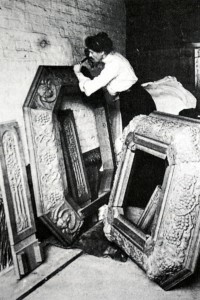 Nellie carves reredos for Nixon Chapel in St David’s Cathedral Hobart Tasmania, DB15. Bookends carved for ‘Gussie’ Wright’s 100th birthday, DB139. Alice White Chair, Tasmanian Museum and Art Gallery, DB179. Ardyn Smith Dower chest, DB114. Gillian Youl Dower chest, DB116. Von Stieglitz Dower chest, DB117. Dower chest for Josephine Anderson who married Nellie’s grandson Charles, DB90. Head of River shield, Scotch College, Melbourne, DB119. Hutchins House Music Shield, DB205. Nellie’s grandson, Charles married Josephine Anderson and Nellie carved cover of their wedding book, DB203. Nellie carves the Presidents’ board for the Naval and Military and Airforce Club, Hobart. Presented by the president Major Geoffrey Charles Payne (Nellie’s son), DB178. Naval, Military and Airforce Presidents chair, DB72. Davson coat of arms, DB188. Nellie meets Rev. Doc. Philip (Tubby) Byard Clayton (Toc H founder) – to carve for All Hallows-by-the-Tower Church London UK. Nellie completes last major work for ‘All Hallows-by-the Tower Church’ London, UK, DB27 and 28. Nellie made life member of the ‘Queen Mary Club’ Hobart TAS at special meeting. Lectern for Hutchins school carved by Nellie, DB49. Nellie’s daughter Madge marries Edward Gadesden Terry, aged 73 years. 31st January Ellen Nora Payne dies peacefully at home in Hobart surrounded by her family. She is cremated at the Cornelian Bay Cemetery in Hobart and her ashes are interred in the family plot in Westbury General Cemetery. Nellie’s son Geoffrey Charles Payne dies in Hobart aged 75. Nellie’s biography commissioned by her daughter Madge and written by journalist and family friend Russell O. Atkinson – 750 copies released. Nellie’s daughter, Madge Terry, dies in Hobart aged 87. Silhouette to honour Nellie worked by John Parish and displayed outside St Andrews church. Brooch made by Michelle Taylor to honour Nellie in Tinker, Tailor, Soldier, Sailor exhibition which tours Queensland, NSW and Vic. DB199. Tasmanian government add Nellie’s name to Tasmanian Women’s Honour Roll. Westbury honours Nellie with her own complete exhibition of all of her carvings. The appreciation of her work was enormous with 7,000 people visit across three sites – Westbury Town Hall, Fitzpatricks Inn and St Andrews Church. January Meander Valley Council community event of the year.